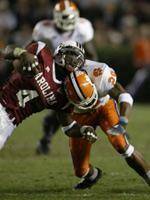 Clemson and South Carolina have agreed to a four-year contract to continue their intra state football rivalry on Thanksgiving weekend. The contract calls for the game to be played the Saturday after Thanksgiving for the next four years. The 2006 game will be played at Clemson on Saturday, November 25. “When the NCAA adopted a 12-game schedule it meant we had to move the game to the weekend after Thanksgiving, or play 12 consecutive weekends,” said Clemson Athletic Director Dr. Terry Don Phillips. “The ACC has also mandated that each league institution play a game the weekend prior to the ACC Championship game, which will always take place on the second Saturday after Thanksgiving. This will be the first time since 1984 that the game has been played the Saturday after Thanksgiving. It was also played the Saturday after Thanksgiving five times in the 1970s.